Bespoke wedding dress in just 6 months?? Imagine you and an award-winning dress designer dream up your dream - together! With your ideas, your wedding colours and your venue in mind and also making sure your own personal style shines through! Say "yes" to you! Imagine how it comes together on a piece of paper, how you can see the image emerging in front of your own eyes and you know instinctively what's right for you, with the help of a skilled designer who knows everything there is to know about different body shapes, and she is not shy suggesting a style that really flatters you, a dress that potentially hides the things you are a bit nervous about and accentuates everything there is to love about you. I have known Mette for years and seen her work many times. Mette is an amazing lady, with bags of energy, full of ideas and inspiration which you can all see in her lovely wedding dresses. If you are looking for your perfect wedding dress, then this article is for you! Mette, originally from Denmark, with a four-year degree in Haute Couture Design, started her business in Edinburgh, responding to a demand for an Edinburgh based Haute Couture Dress Designer! Mette does her magic from 75-79 Cumberland Street Edinburgh EH3 6RD, and employs 4 staff. All her girls have completed Dress Making apprenticeships abroad! So they are a well-trained team of very skilled people! How do I even start having my own wedding dress designed? Is it not a lot more time-consuming? You would send an email to Mette through her website and she would send you initial information about the design process with Freja Fashion. The next step is to make an appointment with Mette where the wedding details are discussed, together with your ideas about your dream wedding dress. For example, a wedding on the beach in Antigua requires a different dress from a wedding in a stately home in Scotland! 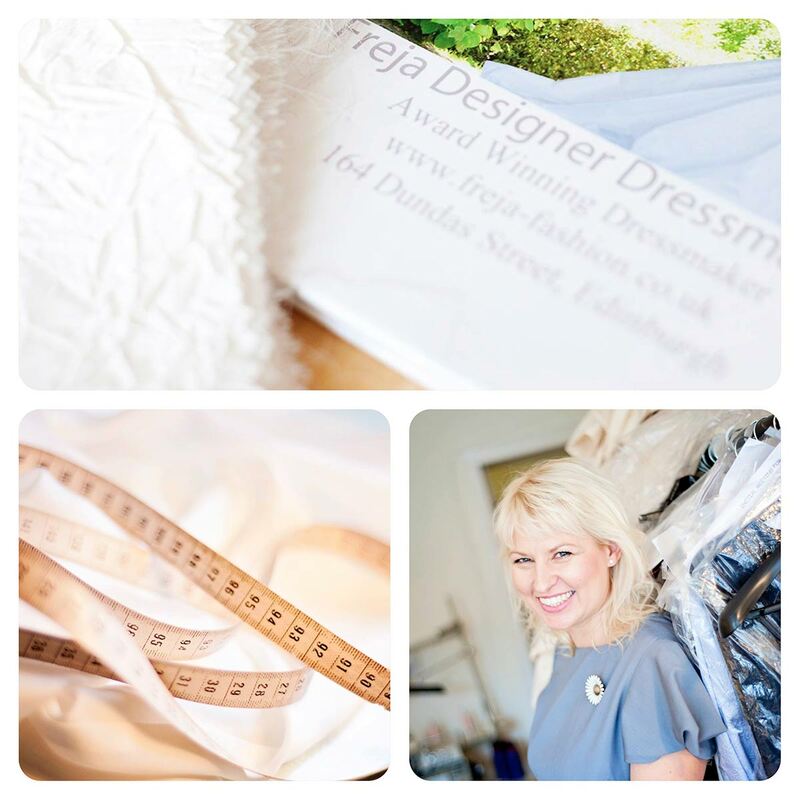 The process is not about sales, but all about finding out as much as possible about your wedding to make sure Mette can design a dress that really fits in with your ideas. During the first meeting, Mette will find out what you really like about yourself, and what type of dress you feel comfortable in. Mette also wants to know if you have any tattoes or scars you want to show up or cover up, for example. After that, you will talk about the fabric for your wedding dress. What is the main character of the dress material? Floaty, stiff, solid, fluid? Mette has literally hundreds of fabric samples at her fingertips. You can see and feel the different properties of the fabrics and Mette can show you what the material would look like by draping over a tailors dummy. If more is required, there is a selection of photo albums with many dresses that Mette and her team have designed and produced. Freja Fashion’s main fabric suppliers are all UK based. Nowadays, most wedding dresses are produced in the Far East. That’s one of the reasons why some wedding dress shops urge their customers to order their dress sometimes 12 or more months before their wedding. For Mette it is important, that her fabric has an ethical background, and her suppliers can confirm the fabrics are sourced conscientiously. Another interesting fact: You can also bring your own material. Again, an off the rail dress shop would be very limited with the garments they have on offer. 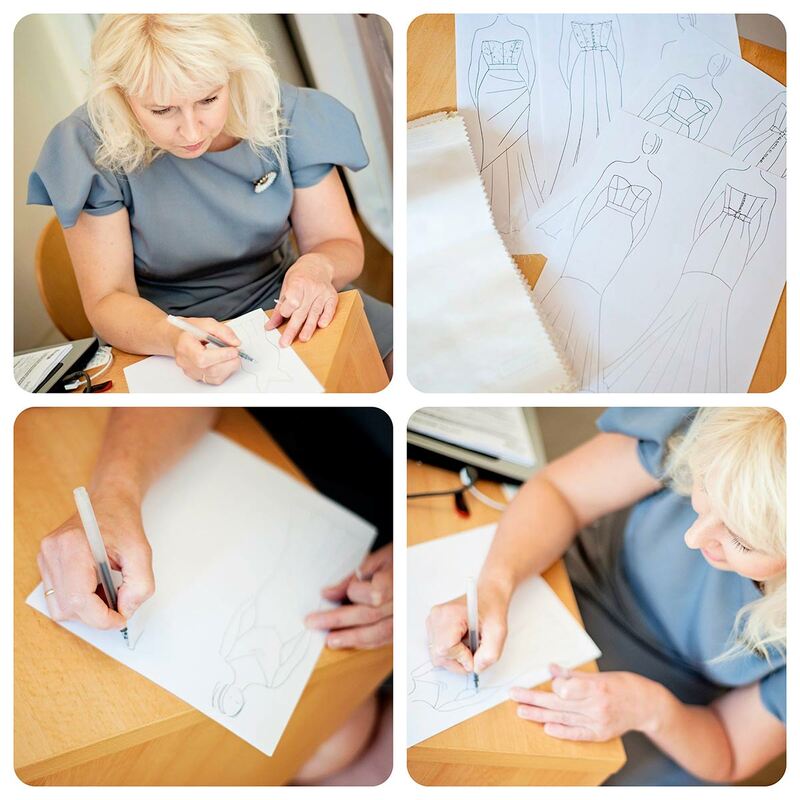 Following the initial meeting, Mette will take the time to put her design ideas down on paper, collated with the different requirements of you, the bride. You will then receive a design proof, a quote, and a contract. And because Mette loves her job, she can never quite stop drawing after the first design, but usually provides a few design options. 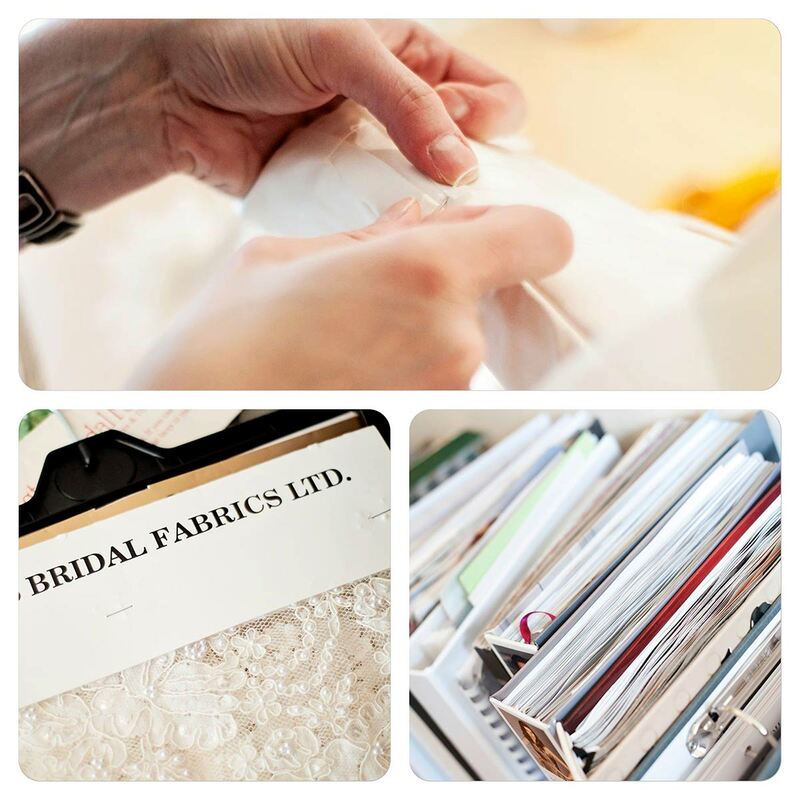 This will then give you the chance to combine the ideas on the proofs and come up with your perfect wedding dress! A few years ago, sleeveless and shoulder-free wedding dresses were mostly what dress shops had in stock. Thankfully, in recent years this has changed and Mette confirms that she designs a lot of dresses with sleeves, shoulder cover and interesting necklines. 6 months or less from start to finish! If a wedding dress shop recommends buying a dress 12 months before the wedding, how long does it take to design a dress? 6 months! Yes, that’s all! Many brides would love to lose weight before their wedding, so if you have to order the dress 12 months before, the alterations might be substantial! Mette would invite you for the initial chat around 6 months before your wedding. Having your own dress designed from scratch and delivered can be a much faster process than just picking one of the racks in a shop! How fantastic! Mette said that during the Winter months, a dress can often be completed in an even shorter period, but it’s harder to do that during the busy summer months, due to the popularity of Mette’s Designs. After the initial meeting, you will receive the first designs within a couple of weeks. Many brides like to get the dress started straight away so they know it’s well under way, and one less thing to worry about! First things first - the Toile! The what??? After you have agreed the design, Mette will invite you to come back for your first fitting to try on the toile. The important thing is to bring your wedding underwear and your bridal shoes too, so she can check how the dress would sit on you. The toile is a mock up of the dress made of beige sheet fabric. You can see it in the images below. It looked very strange on the dummy, but once Mette explained the process, it all started to make sense! This allows her to shape the dress on you. One of the most important things is to check if the dress is well balanced. Is it centred front and back, and are the sides hanging straight down? If you had a collar bone fracture there might be differences in posture which Mette also takes into consideration. The waist and hip lines are drawn with a pen on the toile so the dress will look proportional. This all plays an important part so that the dress is shaped perfectly for your own body. The dress mock up has a lot of notes on it which allows Mette’s staff to translate the mock up into the actual wedding dress. Only after the initial two stages, the actual selected fabric is used to produce the dress. At the next fitting, you can wear the dress in the actual chosen fabric. The dress does not contain any buttons or zips. At this stage, Mette will check if the posture is OK, and the dress sits perfectly. Adjustments are made to the length of straps for example, and your posture will determine how much netting is required under the dress to show off the fabric. If you were to buy a dress in a dress shop, they can only take up the hem but not alter the dress to take your body into consideration. At Freja Fashion, everyone is involved in each garment. Every wedding dress is a combination of the expertise of five experienced people. Usually, the girls will attend the client meeting and take notes so that it is easier to translate the drawings and mock-up details into the proper wedding dress. The third meeting could be the final one. It sounds quite complicated, but it’s a magical process as you are being part of your most important dress being brought to life. How much does it cost to have your own wedding dress designed? Dresses start at around £1500 and at Freja Fashion, you will have a lot more variety than in a shop with brand limitations. For what you pay for an off the rail dress from a retailer, you will still need to calculate £200 to £300 for alterations. This is all included in Mette’s dresses, obviously. The quoted price is the final price for the dress. Did you design your own wedding dress? A resounding YES was the answer: I made mine way too close to my wedding. But I made a denim version of my dress before that, which i still wear, and I have been married for 24 years! How do people find out about the business? A lot of Mette’s clients find out about her by recommendation and through her website. Her work is often featured in wedding magazines and on blogs online, and quite a few wedding suppliers recommend her work.